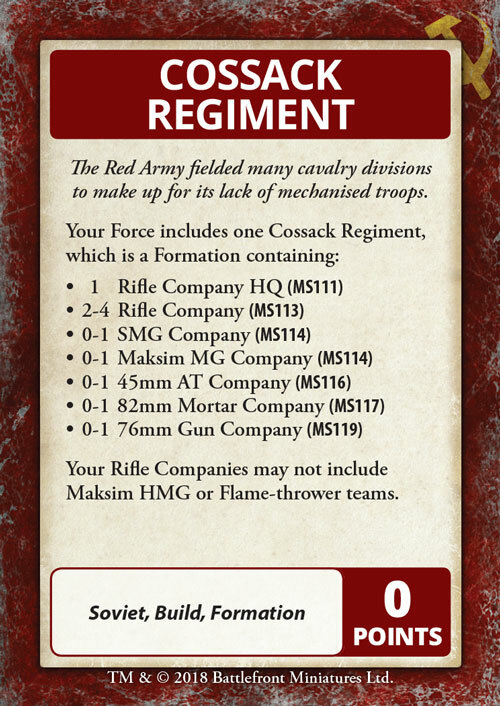 I love Cossacks, and with these command cards we get to transform a normal Soviet Rifle Company into a Cossack Regiment. 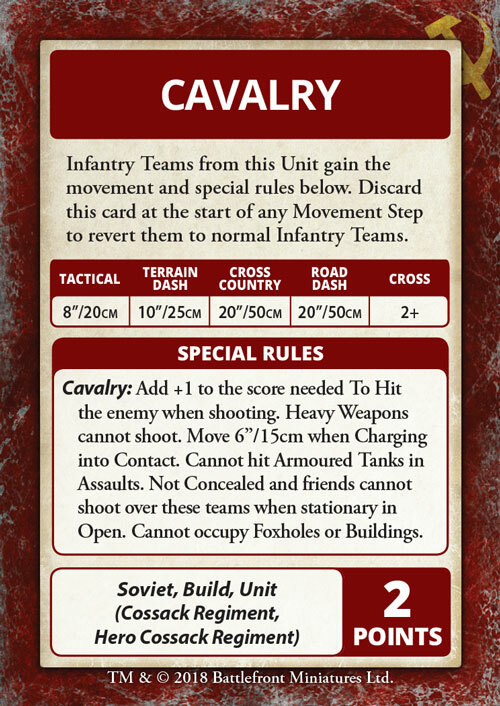 As well as getting a new Formation layout we get access to the Cavalry card that lets your troops mount on horseback and charge into the battle! 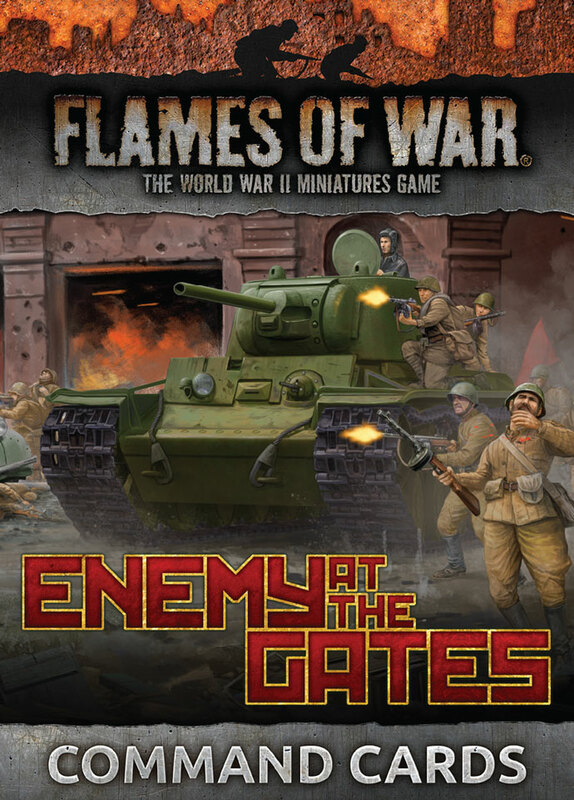 While mounted your Cossacks have increased movement and assault range, you do lose some of your shooting capability but you can discard Cavalry at the start of your Movement Step to revert back into dismounted troops and regain your prior shooting abilities. These cards make your infantry incredibly flexible and fast, letting you get to and secure the objective fast, then dismount so you can defend and hold the newly acquired objective. 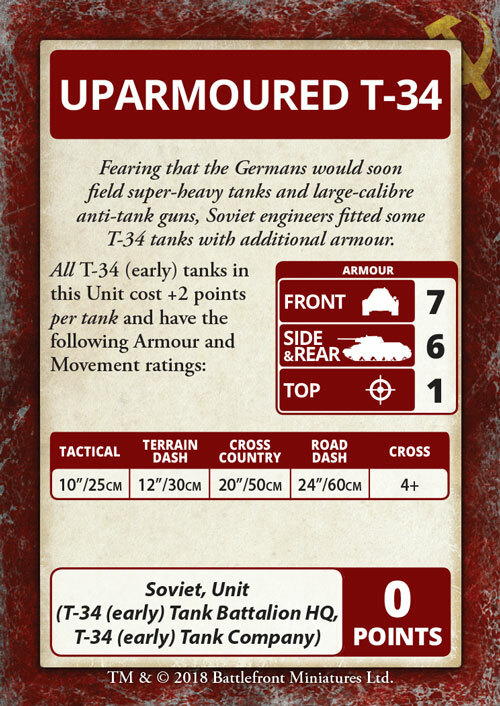 Being a defensive player at heart I love the idea adding the Uparmoured T-34 card to my T-34 (early) companies. Having this card as a command card allows players to choose how much they want to invest into their T-34 tanks, giving them the option to take normal T-34 tanks with more support or take the much more survivable version for just a few more points per tank. The card gives the T-34 (early) an extra point of Front and Side Armour in exchange for some of its speed and two points per tank. You can get 14 of these Uparmoured T-34 tanks for 98 points, not bad, not bad at all. Those who know me, know I love captured tanks. There is something about having something that you shouldn’t have in your army that makes me want to add them. 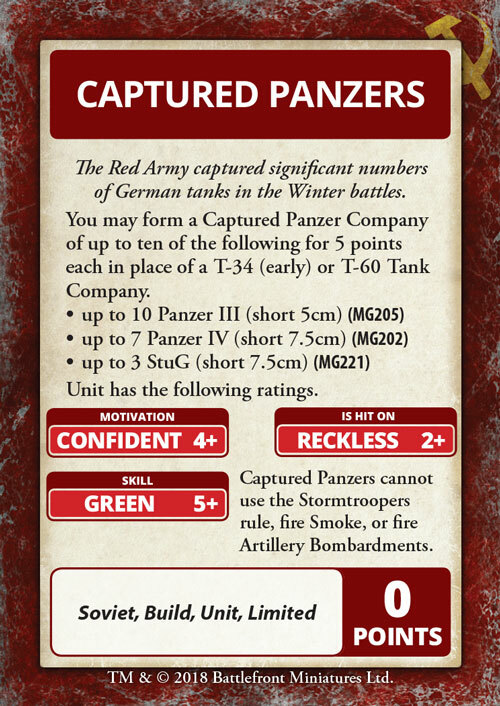 This card is just awesome, you can get a unit of 10 Panzer III tanks, seven panzer IV tanks, or three StuGs tanks. I personally like the idea of having 10 Panzer III tanks in my Soviet tank formation, though I may borrow my German ones first to see how they go before painting up ten in some sweet captured tank colour schemes, on second thought I may just get the tanks to paint up now. In any game Snipers are going to be cool, but this Warrior takes them to the next level. Snipers have a whole lot of rules already and Vasily Grigoryevich Zaytsev just makes them better, first off he is a sniper team you get to add to your Formation on top of any other snipers you bring. So you can have five snipers in your Formation. On top of that he ignores Concealment and Gone to ground status from the models he targets, so he will always hit them on their Is Hit On rating. And if that was not enough he increases the Is Hit On rating of all the other snipers in your force. 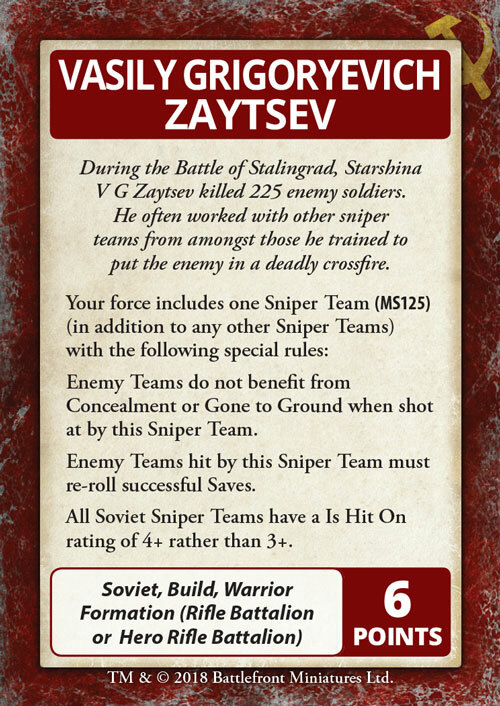 If you are thinking about running a sniper theme in your army, you have to include Zaytsev, he is just that cool.